"A healthier alternative to the deep-fried onion bhajis you find in Indian restaurants. These are baked and exceedingly tasty. They are sweet, tender and very Moorish. Serve hot as an appetizer or starter." Preheat the oven to 400 degrees F (200 degrees C). Line a large baking sheet with parchment paper. Heat 2 teaspoons oil in a skillet over medium heat. Add onions; cook and stir until translucent, 6 to 8 minutes. Sprinkle in chili powder and mix. Add turmeric, 1/2 teaspoon coriander, 1/4 teaspoon cumin, and 1/4 teaspoon ginger. Stir well and remove from heat. Combine chickpea flour, 1/2 teaspoon cumin, 1/2 teaspoon coriander, and salt in a bowl and mix well. Mix in the onions and tomato puree; add a little water until mixture is wet and easy to stir. Drizzle 1 teaspoon olive oil onto the prepared baking sheet. 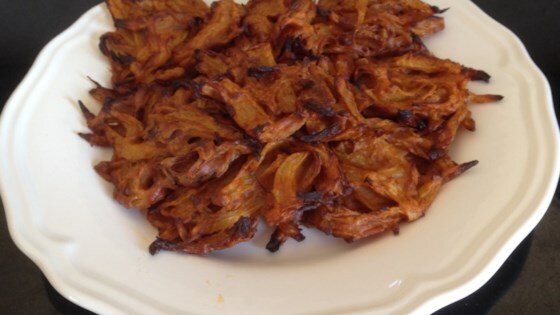 Place 2 tablespoons of the onion mixture onto the baking sheet for each bhaji; flatten slightly with the back of a spoon. Bake in the preheated oven for 20 to 25 minutes. Drizzle remaining oil over the bhajis and continue baking until golden brown, about 25 minutes. If your local supermarket doesn't stock chickpea flour, you can find it in Indian specialty stores.